A new study shows the moon’s magnetic field lasted at least a billion years longer than thought. That suggests other moons may be able to shelter life. The moon's magnetic field lasted at least 1 billion years longer than previously thought, a new study finds. This suggests that alien moons and planets may also have magnetic fields that can survive for a long time and potentially help shelter extraterrestrial life. The moon today does not possess a global magnetic field. However, prior analyses of moon rocks retrieved by the Apollo astronauts suggested that, between 3.56 billion and 4.25 billion years ago, the moon's magnetic field once ranged in strength from 20 to 110 microtesla. In comparison, Earth's magnetic field is 50 microtesla strong. 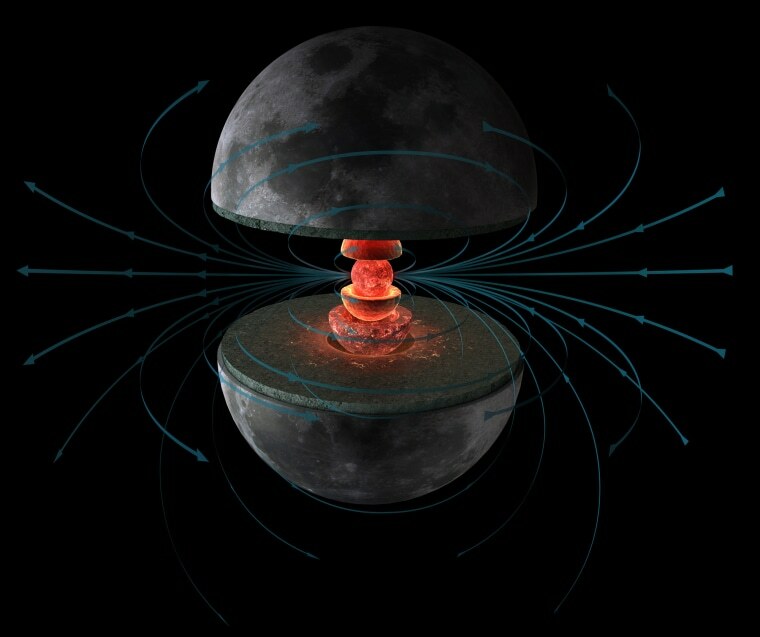 Understanding more about the nature of the magnetic field of Earth's moon could shed light on the magnetic fields of distant moons and planets, which could influence their habitability, according to the researchers who conducted the new study. Earth's magnetic field protects its oceans and its life from dangerous radiation from the sun; the death of Mars' magnetic field could help explain why the Red Planet is now dry and apparently lifeless. "Magnetic fields can shield planets from stellar winds which can strip atmospheres of water, which is important for planetary habitability," study lead author Sonia Tikoo, a lunar geophysicist at Rutgers University in New Brunswick, New Jersey, told Space.com. To learn more about the evolution of the moon's magnetic field, Tikoo and her colleagues examined a lunar rock collected in 1971 from the southern rim of Dune Crater within eastern Mare Imbrium, the vast lava plain known as the "Sea of Rains." The small, young rock, known as Apollo 15 sample 15498, was partially coated with melted glass, and likely formed during a meteor impact on the moon's surface. Until recently, the scientists were unable to find lunar samples much younger than 3.2 billion years old that could accurately record the moon's magnetic fields. "There are very few lunar rocks that are younger than about 3 billion years old, because right around then, the moon cooled off, volcanism largely ceased and, along with it, formation of new igneous rocks on the lunar surface," study co-author Benjamin Weiss at the Massachusetts Institute of Technology said in a statement. Instead of forming from volcanic lava early in the moon's history, 15498 was born from the heat of a cosmic impact much later, the researchers found. Specifically, it was about 1 billion to 2.5 billion years old. The scientists first measured 15498's natural magnetic properties using a very sensitive magnetometer. They next exposed the rock to a known magnetic field in the lab, and heated the rock to 1,436 degrees Fahrenheit (780 degrees Celsius), close to the extreme temperatures in which it originally formed. "You see how magnetized it gets from getting heated in that known magnetic field, then you compare that field to the natural magnetic field you measured beforehand, and from that you can figure out what the ancient field strength was," Weiss said in the statement. These experiments revealed that the moon still harbored a weak magnetic field about 5 microtesla strong from 1 billion to 2.5 billion years ago. In comparison, the moon is about 4.5 billion years old. All in all, these findings suggest "that even small planetary bodies can generate long-lived magnetic fields operating on billion-year timescales, so it is possible that small exoplanets or exomoons might be able to preserve water on timescales long enough to permit life to develop," Tikoo said. Flowing metal in Earth's core serves as the dynamo that generates our planet's magnetic field. It remains a mystery how the lunar dynamo could have lasted so long after the moon was born, researchers said. "It was generally thought that planetary bodies as small as the moon could not have magnetic fields lasting for billions of years because their small sizes would cause their cores to cool and run out of energy to power a dynamo relatively early in solar system's history," Tikoo said. "Therefore, showing that the moon generated a field that lasted at for least 2 billion years, either in a continuous or intermittent state, really pushes the boundaries on what we thought was possible. It challenges us to think of new power sources and mechanisms that can help give the cores of small bodies an energy boost." The researchers suggest that the moon's dynamo may have been driven by two distinct mechanisms — one involving Earth's gravity, and the other involving the cooling of the moon's core. "The lunar magnetic field seems to have operated for a long time in two different strength ranges," Tikoo said. "This tells us that the moon may have had two different mechanisms operating throughout its history — a stronger-field mechanism before 3.5 billion years ago and a weaker-field mechanism later on." "We think that the early strong-field period may have been powered a relatively exotic mechanism — the Earth's gravitational pull on the lunar mantle may have mechanically churned the conducting fluid in the lunar core to drive the dynamo," Tikoo said. "We think this process could have generated enough energy to explain the strong field period. "The late lunar dynamo field we inferred from this study was likely powered by slow solidification of the moon's core," Tikoo said. "As the moon cooled off over time, the molten iron in the core began to solidify like water freezing to ice. This process can release thermal energy and cause hot, buoyant liquid metal to rise in the core like the fluid in a lava lamp. That combination of heat release and buoyancy-driven motion can prove the extra boost needed to power a long-lived magnetic field." Future research will examine just how long the lunar magnetic field lasted, and whether it operated continuously over its lifetime, Tikoo said. The scientists detailed their findings online on Aug. 9 in the journal Science Advances. This article originally appeared on Space.com.